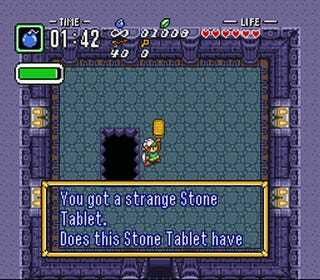 The Legend of Zelda: Ancient Stone Tablets is a nearly forgotten spinoff title originally made for the Super Famicom Satellaview but a new fan English translation has brought the game back to the masses. BS Zelda no Densetsu Inishie no Sekiban was a special title for the Satellaview, a Japanese only peripheral that allowed players to download and play games over a satellite connection. The game itself is basically a remix of A Link to the Past. It’s sort of like a predecessor to Ocarina of Time: Master Quest. You can download this lost Zelda game here. Following this latest translation there are now language patches for English, French, and German. BS Zelda no Densetsu Inishie no Sekiban’s title screen. For a long time, the title was hard to completely emulate due to its unique nature. The game could only be played while it was being broadcast via satellite and changed over time. Audio broadcasts were played during the games, with orchestrated music and voice acting. The elements were missing from ROMs. Until now. The latest additions to the Ancient Stone Tablets translation includes a dubbed version of these original broadcasts. The four hour long performance restoration covers the entire game’s length. It is among the biggest changes to the translation. Satellaview Zelda games could only be played during broadcasted times so that the gameplay could sync with the streamed audio. Content was limited as well. Players could only access certain parts of the overworld and specific dungeons depending on what week the title was being broadcasted. The game was played over four weeks and broadcasted for one hour only. Progress would be saved to a special cassette tape to transfer over to the next week. If you’re interested in learning even more, you can check out this dedicated fan site. It’s been a long journey an English language patch for these games but now plenty more people will be able to enjoy an overlooked relic from Nintendo’s experimental past.